“In this shattering and iconic American novel, PEN prize-winning writer, Smith Henderson explores the complexities of freedom, community, grace, suspicion and anarchy, brilliantly depicting our nation’s disquieting and violent contradictions. OK, y’all. 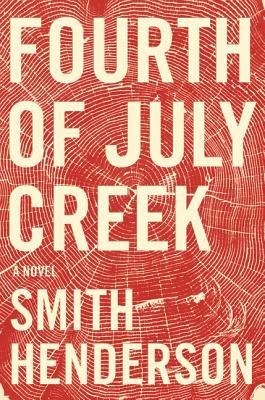 While Fourth of July Creek by Smith Henderson is truly a great work of fiction, I’m just going to straight up admit that it took me two attempts to make it through this novel. On my first try, I made it to page 178 before screaming in frustration and slapping the cover down on my Kindle. Days (weeks?) later, I opened things up to take another go at it, and the awesome power of Henderson’s words finally reached me. Pete Snow is a social worker – the only social worker – in rural Tenmile, Montana. While he has many (many) faults, his heart is truly in the right place and he does care for the children and families he serves. His own marriage has dissolved into flames and his ex-wife and daughter, Rachel, have moved away to Texas. His brother has fled the area due to trouble with the law, and his father has just passed away. Cecil is the troubled thirteen-year-old son of a neglectful, drug-addicted mother. Rachel, Pete’s daughter, has trouble of her own – her story is told in the form of an interview Q & A session at the end of most chapters. Benjamin Pearl is the eleven-year-old son of a paranoid survivalist who lives deep in the mountainous woods just outside of Tenmile. The novel is set in the 1980’s (apparently this qualifies it as “historical fiction”, although since that ages me beyond reason, I refuse to acknowledge it). Reagan is running for President and things in the social services system are much more lax. Pete slowly becomes close to Benjamin and his father, Jeremiah, gaining their trust and zeroing in on some of Jeremiah’s paranoid beliefs. The FBI puts Pete on their radar, and he tries to convince them that the Pearls are essentially harmless but no one is listening. As I mentioned previously, once you get past page 178, this book picks up and begins to shine its brilliant little shiny star. Prior to this, however, there is so much unnecessary… crap. A lot of time is spent on Pete’s drinking habits and adventures. Much time is spent on the beginning and end of a relationship between Pete and another social worker – I ask you, Mr. Henderson, what was the point of this? It was over by page 178, had essentially no effect on the story, and was basically just boring, depressing, and useless to me. My complaints do end there, however. Fourth of July Creek gives an absolutely engaging look at the time and place of its setting, and it poses some questions that I believe need to be asked even now: What is freedom? What does freedom look like? Most importantly of all, a question that is in the headlines often today: at what point do parents’ rights to raise their children as they see fit intersect with society’s views/rules on how to protect its children? I am truly thankful I took the chance to return to finish this novel. It was absolutely worth my time, and had the first 178 pages (repetitious, I know) not been so dull I would have given the novel a much higher rating. I will definitely be recommending this book to friends, and I highly recommend it to you, as well. Fourth of July Creek by Smith Henderson. Buy it, read it, love it. Kindle Unlimited: Boss or Bust? I am very eager to read this book, but I appreciate the heads up on the beginning. Definitely read it – so good!